Less than 24 hours after his father Robert’s death in a crash during practice for the 2008 North West 200, William Dunlop was preparing to race at the event that had taken his life. 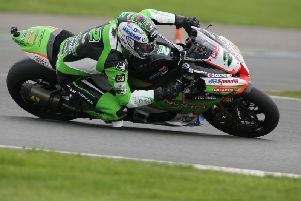 The 47-year-old was killed after he came off his 250cc Honda at Mather’s Cross during practice on the Thursday evening of race week 10 years ago on May 15. Robert Dunlop pictured on the grid before setting off on that fateful practice session at the North West 200 on May 15, 2008. The following night, William vowed to return to Portrush to compete in the 250cc race on Paddy Flynn’s Honda, which was the first event on Saturday's race schedule. Then 22-years-old, the Ballymoney rider gave an exclusive front page interview to the News Letter, which carried the headline ‘I want to race for Dad’ on the morning of Saturday, May 17, 2008. Outlining his intentions, William said: “My dad put a lot of work into preparing my 250 after I had problems with it after the Easter short circuit races. “I want to take a run out in the 250 race as a tribute to him. I remember him telling me that I could win the 250 race at the North West on this bike. William Dunlop and his brother Michael pictured before practice at the North West 200 in 2008. “The plan is to just go out and ride around and see how it goes. “I know that he would have wanted me to ride in the 250 race. There will be other people who will think that it’s crazy and who wouldn’t want me to do it, but I would like to. Stricken with grief, William said the tragic events that unfolded the previous evening had been a scenario he had dreaded. “When you hear that there’s been an accident, you always hope that it’s someone else and that dad or Michael haven’t been involved. “That’s not a nice thing to say, but that’s just what your immediate reaction is. On a sombre race morning, NW200 officials met and ruled they would not permit William to race. Irrespective, he took up his position on the grid. His younger brother Michael also decided that he, too, was going to compete and his machine was also wheeled out onto the line. To his great dismay, William was unable to start the race due to a problem with his Honda. Michael, though, had no such issues and famously went out and won the race. There wasn’t a dry eye in the house as he took the chequered flag ahead of Christian Elkin to create a moment of unprecedented motorcycling sporting greatness. Robert would have been proud of them both.